We seriously need to do something about CO2 emissions. Besides shifting to renewable energy sources and increasing energy efficiency, we need to start putting some of the CO2 away before it reaches the atmosphere. Perhaps the impacts of human-induced climate change will be so severe that we might even have to capture CO2 from the air and convert it into useful products such as plastic materials or put it someplace safe. A group of scientists from several European countries and the United States including myself met in the middle, in Iceland, to figure out how CO2 could be put away safely – in the ground. 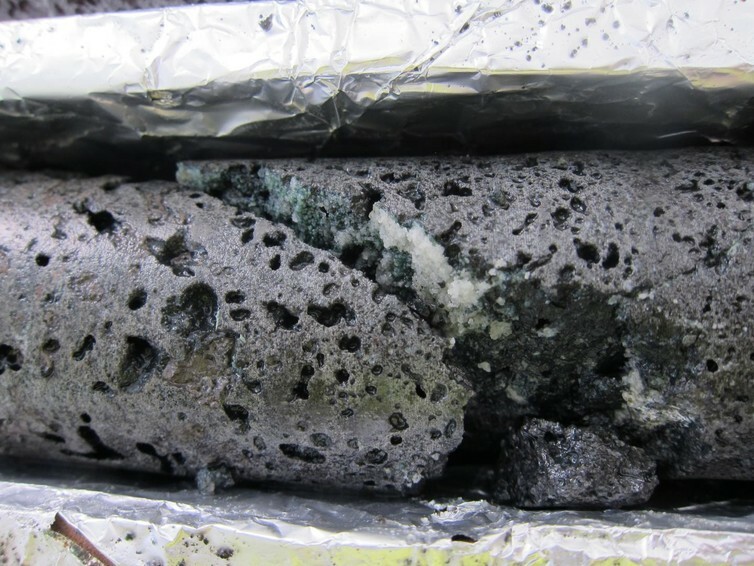 In a recently published study, we demonstrated that two years after injecting CO2 underground at our pilot test site in Iceland, almost all of it has been converted into minerals. The injection well that pumped waste CO2 and hydrogen sulfide gas from a geothermal well underground. Iceland is a very green country; almost all of its electricity comes from renewable sources including geothermal energy. Hot water from rocks beneath the surface is converted into steam which drives a turbine to generate electricity. However, geothermal power plants there do emit CO2 (much less than a comparable coal-fired power plant) because the hot steam from deep wells that runs the turbines also contains CO2 and sometimes hydrogen sulfide (H2S). Those gases usually just get released into the air. Is there another place we could put these gases? Conventional carbon sequestration deposits CO2 into deep saline aquifers or into depleted oil and natural gas reservoirs. CO2 is pumped under very high pressure into these formations and, since they held gases and fluids already over millions of year in place, the probability of CO2 leaking out is minuscule, as many studies have shown. In a place like Iceland with its daily earthquakes cracking the volcanic rocks (basalts), this approach would not work. The CO2 could bubble up through cracks and leak back into the atmosphere. However, basalt also has a great advantage: it reacts with CO2 and converts it into carbonate minerals. These carbonates form naturally and can be found as white spots in the basalt. The reactions also have been demonstrated in laboratory experiments. For the first test, we used pure CO2 and pumped it through a pipe into an existing well that tapped an aquifer containing fresh water at about 1,700 feet of depth. Six months later we injected a mixture of CO2 and hydrogen sulfide piped in from the turbines of the power plant. Through a separate pipe we also pumped water into the well. In the well, we released the CO2 through a sparger – a device for introducing gases into liquids similar to a bubble stone in an aquarium – into water. The CO2 dissolved completely within a couple of minutes in the water because of the high pressure at depth. That mixture then entered the aquifer. We also added tiny quantities of tracers (gases and dissolved substances) that allow us to differentiate the injected water and CO2 from what’s already in the aquifer. The CO2 dissolved in water was then carried away by the slowly flowing groundwater. Downstream, we had installed monitoring wells that allowed us to collect samples to figure out what happened to the CO2. Initially, we saw some of the CO2 and tracers coming through. After a few months, though, the tracers kept arriving but very little of the injected CO2 showed up. Where was it going? Our pump in the monitoring well stopped working periodically, and when we brought it to the surface, we noticed that it was covered by white crystals. We analyzed the crystals and found they contained some of the tracers we had added and, best of all, they turned out to be mostly carbonate minerals! We had turned CO2 into rocks. The CO2 dissolved in water had reacted with the basalt in the aquifer and more than 95 percent of the CO2 precipitated out as solid carbonate minerals – and it all happened much faster than anticipated, in less than two years. The fracture in this basalt rock shows the white calcium carbonate crystals that form from the injection of CO2 with water at the test site. This is the safest way to put CO2 away. By dissolving it in water, we already prevent CO2 gas from bubbling up toward the surface through cracks in the rocks. Finally, we convert it into stone that cannot move or dissolve under natural conditions. One downside of this approach is that water needs to be injected alongside the CO2. However, because of the very rapid removal of the CO2 from the water in mineral form, this water could be pumped back out of the ground downstream and reused at the injection site. Ours was a small-scale pilot study, and the question is whether these reactions would continue into the future or pores and cracks in the subsurface basalt stone would eventually clog up and no longer be able to convert CO2 to carbonate. Our Iceland geothermal power plant has increased the amount of gas injected several times in the years since our experiment was started using a different nearby location. No clogging has been encountered yet, and the plan is to soon inject almost all waste gases into the basalt. This process will also prevent the toxic and corrosive gas hydrogen sulfide from going into the atmosphere, which currently still can be detected at low levels near the power plant because of its characteristic rotten egg smell. The very reactive rocks found in Iceland are quite common on Earth; about 10 percent of the continents and almost all of the ocean floors are made of basalt. This technology, in other words, is not limited to emissions from geothermal power plants but could also be used for other CO2 sources, such as fossil fuel power plants. The commercial viability of the process still needs to be established in different locations. Carbon mineralization adds costs to a power plant’s operation, so this, like any form of carbon sequestration, needs an economic incentive to make it feasible. People like to live near coasts, and many power plants have been built near their customers. Perhaps this technology could be used to put away CO2 emissions in coastal areas in nearby offshore basalt formations. Of course, there would be no shortage of water to co-inject with the CO2. If we are forced to lower atmospheric CO2 levels in the future because we underestimate the damaging effects of climate change, we could perhaps use wind or solar-powered devices on an ocean platform to capture CO2 from the air and then inject the CO2 into basalt formations underneath. Carbon mineralization, as demonstrated in Iceland, could be part of the solution of our carbon problem.